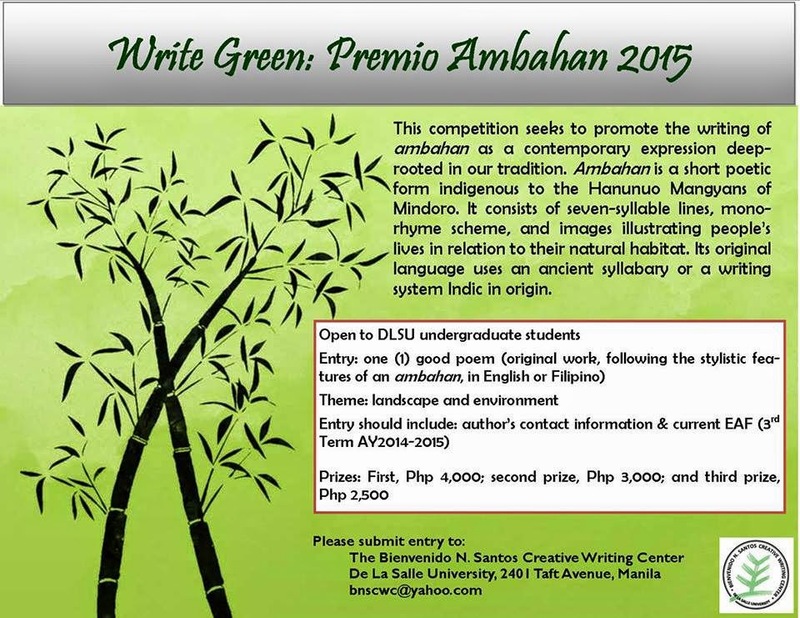 The Bienvenido N. Santos Creative Writing Center (BNSCWC) announces Write Green: Premio Ambahan 2015. This competition seeks to promote the writing of ambahan as a contemporary expression deep-rooted in our tradition. Ambahan is a short poetic form indigenous to the Hanunuo Mangyans of Mindoro. It consists of seven-syllable lines, mono-rhyme scheme, and images illustrating people’s lives in relation to their natural habitat. Its original language uses an ancient syllabary or a writing system Indic in origin. When a Mangyan poet writes of a flower, he writes of it not for the purpose of celebrating its beauty or fragrance but to make it an allegory or symbol of human life, its problems, and its challenges. Premio Ambahan is open to all bona fide undergraduate students of De La Salle University, Taft and STC campuses. The entry is one (1) good poem, an original work. It should follow the stylistic features of an ambahan, composed in English or Filipino. Theme is landscape and environment. The poem may reflect on green things, retell scenes of disasters, rediscover myth and milieu, imagine the future, or just love the planet. Only one entry per contestant will be accepted. Entry should include author’s full contact information (address, email, phone) and copy of current EAF (3rd Term AY2014-2015). Not eligible for the contest are the student personnel of BNSCWC. Three winners will be selected to receive the following prizes: First, Php 4,000; second prize, Php 3,000; and third prize, Php 2,500. The decision of the Board of Judges is final. Entry deadline: 28 February 2015. Winners will be announced in March 2015.